Rival pro-Spanish unity and pro-independence rallies again demonstrated the depth of feeling in deeply-divided Catalonia on Saturday. Calls for ousted Catalan leader Carles Puigdemont to be jailed for leading the separatist push were made in Barcelona amid fears at the impact it is having on the local economy. “The anarchists are destroying the country with the independence drive,” said pro-unity demonstrator Maria Pages, a 62-year-old dentist. 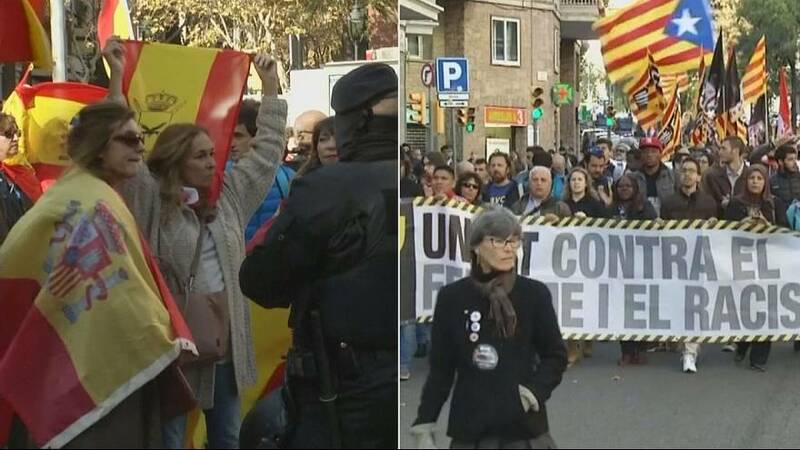 Those who back a breakaway however were also on the march on Saturday in a demonstration against fascism, racism and to promote the coexistence of the divided population. “This is a quiet and peaceful society that wants freedom and does not want fascism on the streets,” said social educator Neus Medina, 54. A heavy police presence helped keep the peace despite strong emotions amid Spain’s most serious political crisis since its return to democracy four decades ago.